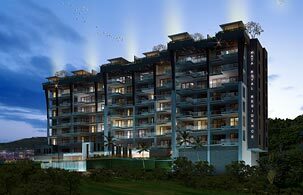 Kata Royal Residence is a superior condominium in Phuket residence with magnificent west-facing views overlooking Kata Bay. Built to the highest international standards and designed with perfectionists in mind. Kata Royal Residence isn’t just an inspiring place to live. It’s a smart choice of property. Kata Royal Residence is perfectly situated to offer residents the best of both words. The low-rise residential development is close to the sea on elevated ground to give every resident a beautiful, unobstructed view of Kata Bay, which is less than 200 meters away by road, while back rooms have views of the green hills island.